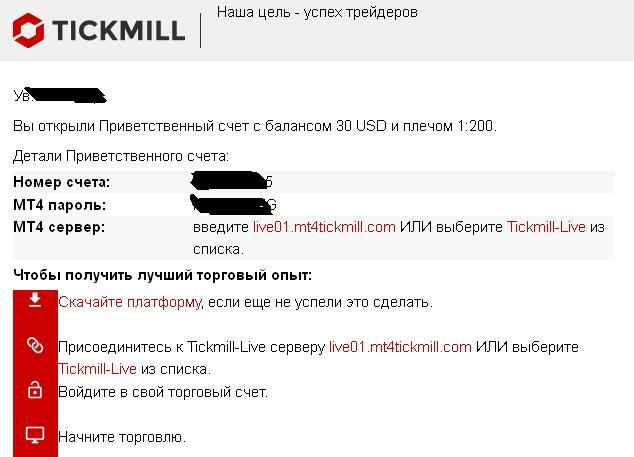 Today I’d like to give you information about receiving the welcome forex bonus from broker Tickmill. If you open a special welcome account then this britain STP broker credits 30 USD as a free bonus to the balance of your account. Only new clients may receive this money and use for trading without any risk for their own money. This free $30 may help new traders to check the quality of Tickmill trading service. Some words about this company. The owner of brand is Tmill UK Limited. From 2016 this company is regulated by the UK Financial Conduct Authority (FCA). Before 2016 company was regulated only by the FSA of Seychelles. Tmill UK Limited is a member of the Financial Services Compensation Scheme (FSCS) in the UK. So, clients are also covered in the event of default up to the value of £50000.00. Broker is quite popular among traders because of low spreads, which helps to trade on scalping strategies very profitable. But using of other trading strategies also does not cause any problems. Company does not charge any fee for deposit and withdrawal. 2) Scroll the site page to the bottom. You will see there the registration form for opening the welcome trading account. Please, note that you must fill in it only the Latin letters (English letters). Also, you should take care not to make a mistake in writing your last name, first name and date of birth. You can also choose the leverage for your Tickmill bonus account that suits you, but remember that with $30 at your balance and a small leverage you will not earn much. 4) You may start your trading. Also I’d like to mention about the other terms of this bonus offer. This Tikmill bonus money can not be withdrawn or transferred. You can withdraw only your earned profit. The minimum sum of profit, which you may withdraw, must be at least $30 (the maximum, which can be withdrawn, must be not more than $100). The broker does not set any conditions for trading volume. Money is available for trading for 90 days after opening Welcome account. After the 90 days you have an additional 30 days to claim your trading profit. You may only transfer it to the live MT4 trading account (Classic, ECN Pro, VIP account type). 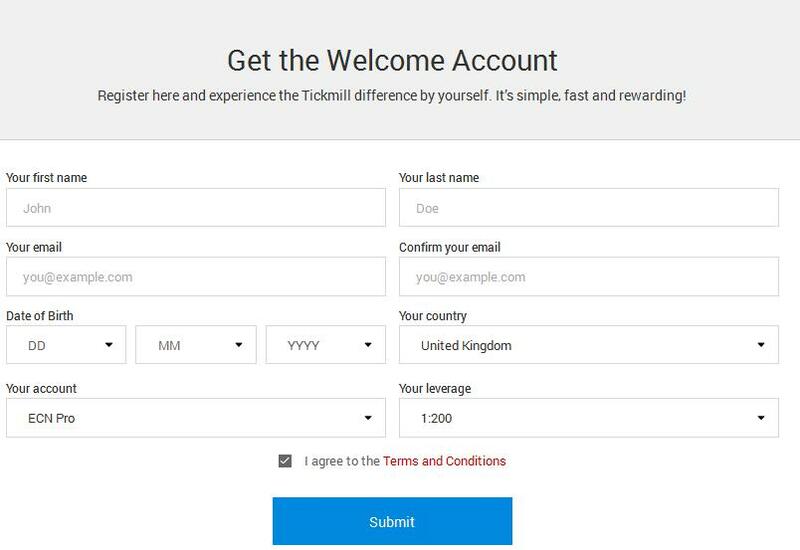 Before transferring profit from the no deposit bonus you should register real account at Tickmill official site, using the same information, which you used for registration the welcome account. Then you have to validate your account. For this procedure you need to upload your identification documents. If all will be ok then you may begin to open live MT4 trading account. To activate this account you have to deposit a minimum of $100. 100 dollars is the tickmill minimum deposit in this year. Only after finishing this stage you may request the transfer of your bonus trading profit to live MT4 account. When trading profit (from welcome bonus) will be transferred to your real account balance, you may use it for usual trading or you may request the withdrawal from Tickmill no deposit bonus account. Yes, Victoria, you can get it. Just click on this link Tickmill $30 bonus and pass the registration procedure. And, if you will do this, Tickmill will credit this free bonus to your trading account. of course, click on the broker banner and follow the instuction from this post. 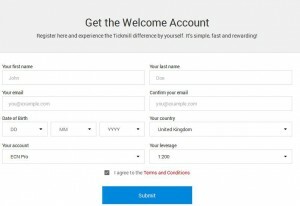 Write a comment to "How to get Tickmill welcome bonus"